Preoperative imaging and adequate planning should be the standard in primary hip and knee arthroplasty procedures. Modern imaging technologies can give the operating surgeon an improved preoperative understanding of the anatomical findings [1-3]. Planning of the procedure should then be easier and appropriate reconstructive implants and augments can be ordered. This may be more imperative in the evaluation of complex three-dimensional anatomic areas such as the acetabulum, where plain radiography does not clearly depict the complexity of osseous destruction. In cases in which the acetabular defect causes a protrusion of the cup into the hemipelvis, serious complications may arise during the revision procedure. Some intrapelvic complications have been described. These may occur primarily during removal of migrated components or during placement of cage screws [4-6]. The most commonly described complications are sciatic, femoral, and obturator nerve palsies and hematomas secondary to serious arterial injuries [1,4,7,8]. In this article, we underline the importance of preoperative imaging, and we provide information gained from three-dimensional preoperative imaging in cases in which components were medial to Köhler’s line (teardrop line). 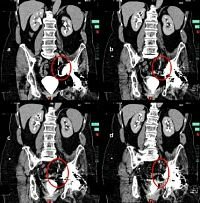 Moreover, this report points out that in addition to blood vessels and nerves, other structures – in this case, the urethra (ureter) – may cause serious complications in hip revision surgery. 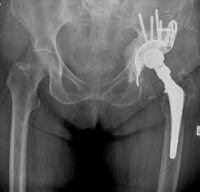 A 69-year-old woman underwent a primary total hip arthroplasty of the left hip for primary degenerative osteoarthritis at another institution. She developed isolated loosening of the cup and associated bone loss 8 years after the index procedure was performed. She underwent revision surgery, which entailed the implantation of a reinforcement acetabular reconstruction cage (Ganz ring). Postoperatively, the patient remained symptomatic, complaining of residual pain after the revision procedure. She was referred to our institution 6 years after the revision procedure with increasing pain, particularly with weight-bearing, and with a reduced range of movement. Mobility was only possible with the aid of two forearm crutches with an inability to weight-bear on the left side. On examination, there was a leg length discrepancy of 2 cm, with the left leg shorter than the right, and an inability to perform a single leg stance. Preoperative range of motion of the left hip was limited to -0-100º of flexion, abduction/adduction was limited to 20-0-10º, and internal/external rotation was 20-0-15º. Clinically, there was localized tenderness noted on axial compression in the groin. Plain radiographs revealed protrusion of the reinforcement ring into the pelvis and complete migration of the anchoring hook into the pelvis, with close proximity to the anatomic structures and other major soft tissue structures. There was no evidence of stem loosening or migration noted (Figures 1, 2). Based on these findings and particularly the position of the anchoring hook and close proximity to intrapelvic structures, a CT scan was performed (Figure 3). Figure 1. Pelvis AP identifying the migration of the reinforcement hook into the pelvis. Figure 2. Preoperative radiograph, lateral view. Figure 3. Preoperative conventional CT scan without contrast agent. The initial conventional CT-scan revealed the close proximity of the anchoring hook to the urethra. Consequently, a continuative contrast agent-based CT scan was performed, which showed the urethra looped around the hook of the reinforcement ring. No other relevant soft tissue encroachment was noted, and an appropriate pre-operative plan was performed accordingly (Figures 4, 5). Figure 4. CT with contrast agent, which clearly identifies the anatomic relation between the hook and the urether within the contrast flow. Figure 5. A further 3-D reconstruction and scrolling throughout all slices allows the surgeon to clearly rule out a complete bracing of the hook around the urether. Through a posterior approach, the complete reinforcement ring was safely retrieved, with particular attention paid to identifying the hook and carefully dissecting the surrounding soft tissues. Intra-operative findings confirmed that the reinforcement ring had protruded into the pelvis. A large osseous defect was noted in the acetabulum, which required further fixation and stabilization utilizing a larger complete reinforcement ring. Five additional screws were placed into the ileum. The osseous defect was addressed with a combination of structural allograft and impaction bone grafting. Finally, an all-polyethylene acetabular cup was cemented into place. Leg lengths and soft tissue tensioning was restored using an additional long neck and offset variation (Figure 6). Figure 6. 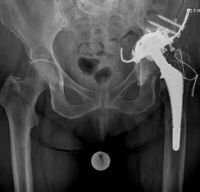 Pelvis AP final result with a complete reinforcement ring and combined allograft impaction grafting to stabilize the all-polyethylene cup. At a 24-month follow-up visit, the patient was doing well; she was pain free and walking unaided. The patient had no further complications, and her Harris Hip Scores had improved from 38 preoperatively to 80 postoperatively. Pelvic structures are prone to injury during revision hip surgery [1, 4,6-8]. Preoperative identification of patients at risk for vascular and nerve injury during these procedures can be performed using plain radiography, angiography, or CT or MRI scans. In this case report, we demonstrated the close proximity of the acetabular metalware to relevant anatomical structures. This is especially true in complex revision procedures that include fixation screws and anchoring hooks, which can easily protrude into the pelvis. Damage to the urethra is a relatively rare but possible complication that can occur in revision procedures. To gain a greater preoperative understanding and subsequently prevent serious injuries, a CT or MRI scan should be performed preoperatively . Hollis et al describe a significant increase in the utilization of MR imaging in the evaluation of complications related to total hip arthroplasty. This is because of the ability to image periarticular soft tissues, including muscle, tendon, and neurovascular structures, combined with the ability to limit the prosthesis-induced artifact. The absence of ionizing radiation is another advantage of MRI over CT scanning [9,10]. Most urologic injuries encountered by orthopaedic surgeons are associated with pelvic trauma. Acute injuries to the bladder, prostate, and urethra may occur in association with 13.5% to 46.6% of pelvic fractures . 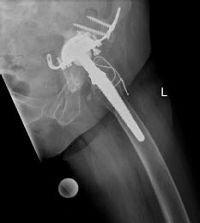 There are no publications to date that describe a direct urethral injury caused during revision hip surgery. Components that are medial to Köhler’s line on plain radiography require additional evaluation. A CT or MRI scan usually reveals the proximity of major structures, such as the urethra, and it also provide valuable information regarding the appropriate placement of bone graft, cement, screws, and the acetabular components . Another advantage of preoperative CT scans is the possibility of generating three-dimensional models so that a better understanding of the acetabular anatomy is possible. With this information, the need for custom made implants or cages can also be performed . A relative disadvantage of CT and MRI scans is implant-related metal artifacts. Most studies show that these artifacts can be significantly reduced with proper parameter modifications and/or the use of specially designed software . The two-dimensional nature of radiographs limits their ability to accurately determine component alignment, such as the true version of the acetabular component in total hip arthroplasty, especially when patients are not properly positioned. CT has proved to be more reliable than radiographic analysis for intraoperative estimation of component alignment, providing a direct three-dimensional evaluation of cup version in total hip arthroplasty [14-16,18,19]. In cases in which the stem has to be revised, a CT scan offers additional information concerning the geometry of the femoral bone which aids in optimizing the implant size . We believe that in severe cases of component migration in hip arthroplasty, a preoperative CT or MR examination can give important information about the relationship of implants to intrapelvic structures. With modern CT technology, the radiation exposure seems justifiable. The per-patient costs are also relatively low . MR imaging has no radiation exposure but relatively high per-patient costs. In conclusion we recommend the use of a distinct modern multiplanar imaging technique in cases of unclear protrusion of the hardware into the pelvis. CT and MRI scans are accurate and cost effective, which justify their regular use in preoperative planning. H.C. Schmitz, C.C. Egidy, T. Gehrke, and D. Kendoff are from the ENDO-Klinik Hamburg, Helios Group, Hamburg, Germany. H. Al-Khateeb is from the Royal National Orthopaedic Hospital, Stanmore, UK, and The John Charnley Trust. G. Cárdenas is from the Hospital ABC Santa Fe, Mexico City, México. Schmitz HC, Egidy CC. 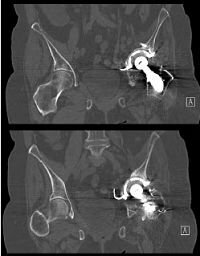 Al-Khateeb H, Cárdenas C, Gehrke T, Kendoff D. Importance of preoperative imaging in acetabular revision surgery – a case report. The Open Orthopaedics Journal. 2012;6:215-219. © Schmitz et al. ; Licensee Bentham Open. This is an open access article licensed under the terms of the Creative Commons Attribution Non-Commercial License, which permits unrestricted, non-commercial use, distribution and reproduction in any medium, provided the work is properly cited. Gerber A, Pisan M, Zurakowski D, Isler B. Ganz reinforcement ring for reconstruction of acetabular defects in revision total hip arthroplasty. J Bone Joint Surg Am 2003; 85-A(12): 2358-64. Carroll FA, Hoad-Reddick DA, Kerry RM, Stockley I. The survival of support rings in complex acetabular revision surgery. J Bone Joint Surg Br 2008; 90(5): 574-8. Kiefer H. Differences and opportunities of THA in the USA, Asia and Europe. In: Chang JD, Billau K, Eds. Ceramics in Orthopaedics. Proceedings of the 12th BIOLOX® Symposium on Bioceramics and Alternative Bearings in Joint Arthroplasty; 2007 Sep 7-8; Seoul, Republic of Korea. Berlin: Springer 2007; pp. 3-8. Nehme AH, Matta JF, Moufarrej NM, Jabbour FC, Moucharafieh RC, Feghaly MA. False aneurysm of the external iliac artery caused by aseptic loosening and migration of a cemented cup. Hip Int 2010; 20(1): 123-5. Barrack RL, Burnett SJ. Preoperative planning for revision total hip arthroplasty. J Bone Joint Surg Am 2005; 87(12): 2800-11. Lavernia CJ, Cook CC, Hernandez RA, Sierra RJ, Rossi MD. Neurovascular injuries in acetabular reconstruction cage surgery: an anatomical study. J Arthroplasty 2007; 22(1): 124-32. DeBoer DK, Christie MJ, Brinson MF, Morrison JC. Revision total hip arthroplasty for pelvic discontinuity. J Bone Joint Surg Am 2007; 89(4): 835-40. Kickuth R, Anderson S, Kocovic L, Ludwig K, Siebenrock K, Triller J. Endovascular treatment of arterial injury as an uncommon complication after orthopedic surgery. J Vasc Interv Radiol 2006; 17(5): 791-9. Potter HG, Foo LF, Nestor BJ. What is the role of magnetic resonance imaging in the evaluation of total hip arthroplasty? HSS J 2005; 1(1): 89-93. Potter HG, Montgomery KD, Heise CW, Helfet DL. MR imaging of acetabular fractures: value in detecting femoral head injury, intraarticular fragments, and sciatic nerve injury. AJR Am J Roentgenol 1994; 163(4): 881-6. Nehme A, Maalouf G, Oakes D, Ghantous I, Trousdale RT. Persistent bladder entrapment following acetabular fracture with subsequent vesical injury during total hip arthroplasty. A case report. J Bone Joint Surg Am 2005; 87(4): 870-3. Taunton MJ, Fehring TK, Edwards P, Bernasek T, Holt GE, Christie MJ. Pelvic discontinuity treated with custom triflange component: a reliable option. Clin Orthop Relat Res 2012; 470(2):428-34. Buckwalter KA, Parr JA, Choplin RH, Capello WN. Multichannel CT Imaging of Orthopedic Hardware and Implants. Semin Musculoskelet Radiol 2006; 10(1): 86-97. Blendea S, Eckman K, Jaramaz B, Levison TJ, Digioia AM 3rd. Measurements of acetabular cup position and pelvic spatial orientation after total hip arthroplasty using computed tomography/radiography matching. Comput Aided Surg 2005; 10(1): 37-43. Kalteis T, Handel M, Herold T, Perlick L, Paetzel C, Grifka J. Position of the acetabular cup — accuracy of radiographic calculation compared to CT-based measurement. Eur J Radiol 2006; 58(2): 294-300. Huppertz A, Radmer S, Asbach P, et al. Computed tomography for preoperative planning in minimal-invasive total hip arthroplasty: radiation exposure and cost analysis. Eur J Radiol 2011; 78(3):406-13. McArthur B, Cross M, Geatrakas C, Mayman D, Ghelman B. Measuring acetabular component version after THA: CT or plain radiograph? Clin Orthop Relat Res 2012 [Epub ahead of print]. Ghelman B, Kepler CK, Lyman S, Della Valle AG. CT outperforms radiography for determination of acetabular cup version after THA. Clin Orthop Relat Res 2009; 467(9): 2362-70.